Midweek day off for me so i was Norwich bound early this morning armed with the camera to see what i could see! 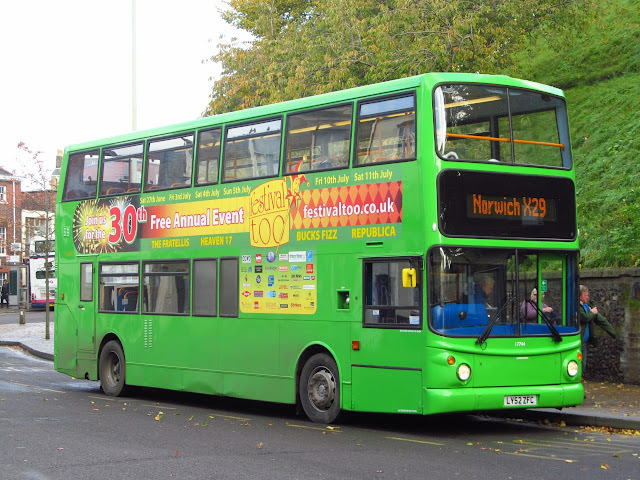 After a trip aboard Lowestoft Gemini 37564 on the X1 from Acle i ventured into the city to have a look at what was in action today, my first sighting was Stagecoach Norfolk Trident 17744 LY52ZFC working the X29 service from Fakenham, this is in an allover Green livery still carrying adverts for a July Music Festival! Another vehicle in my sights today was the colour changing Volvo B7RLE 66976 KX05MGZ which is now adorned with a bright yellow front rather than the more Orange looking version it first appeared with a few weeks ago, after two unsucessful visits it was third time lucky as it pulled into the Yellow line stop at the top of Castle Meadow. The Weather was undecided today with the sun now very low, Castle Meadow is not the best for photos so i decided to try a new spot, i wandered along Theatre Street near the BBC Studios and found a sunny spot for various services coming back into the city from the outskirts and managed some nice winter sun shots. Vehicle News to report is the return from Rotherham today after refurbishment of 32112 LT02ZDL which should be in Turquoise Line livery whilst 33169 LR02LYJ has made the trip North for refurbishment. Coach 20501 AO02RBY has had its MOT and is currently working out of Yarmouth depot once more on contract work. 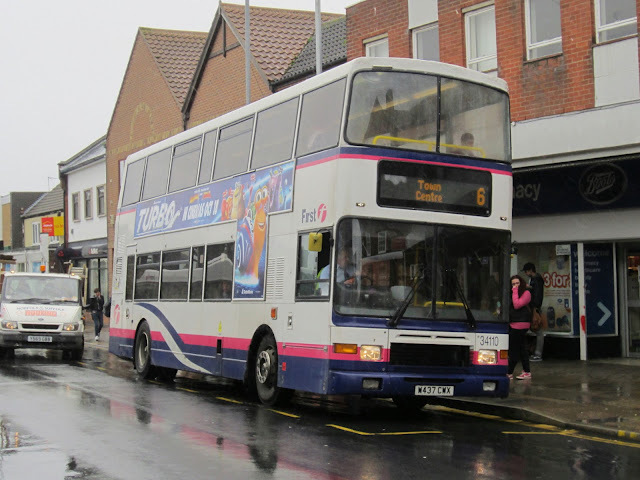 Final sighting of the day was Lowestoft Gemini 37579 AU58EDK working the 16.08 Yarmouth to Martham service, it was recently transferred from Yarmouth it is now minus any Depot lettering and was captured in the evening gloom literally on my doorstep. Rather pleased with the result as it was rather dark. 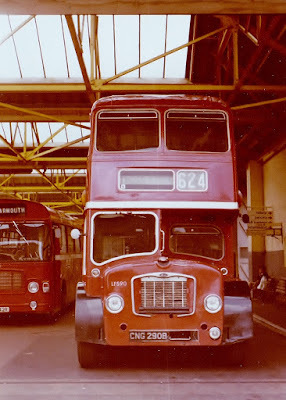 Thought to have been taken during 1980, the photo also shows part of another Bristol/ECW vehicle, TCL142R. 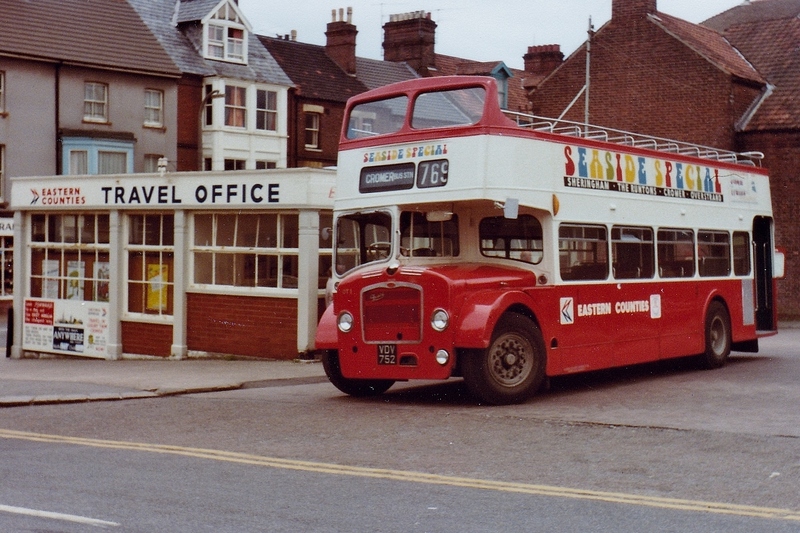 The LH6L was new three years earlier. 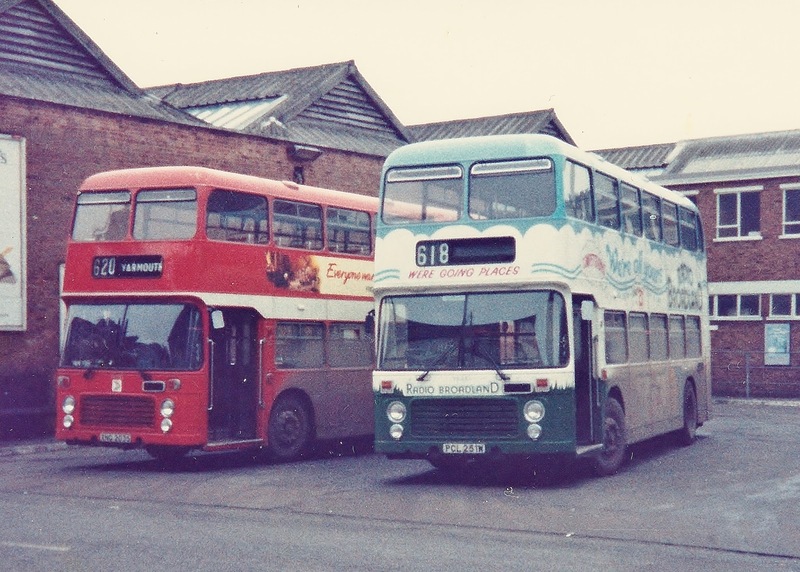 LFS90 incidentally met its end following a visit to the scrapman, PVS of Barnsley, in September 1980. So it was probably eking out the last days of its usefulness! At the end of March this year I posted that the last Olympian built for use in the UK currently resides in a withdrawn state in the rear yard at First Great Yarmouth's Caister Road depot. However, the renewed publicity from the blog together with being armed with this information helped generate more interest from would be preservationists. Together we both sent emails back and forth to persons interested in an attempt to save it. One individual from Essex made contact and was was positive he could save it. 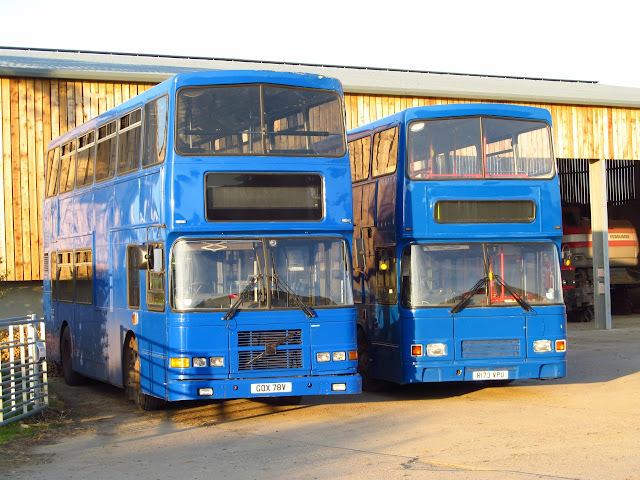 Following a period of negotiation, I can now exclusively reveal that it has been saved and will become part of Yeldham Transport Collection under the ownership of Colin Thorne. Colin has already saved three of his own buses (see www.preservedbuses.com so he certainly appreciates what's required when it comes to the work involved in getting them back on the road after bus companies are finished with them. 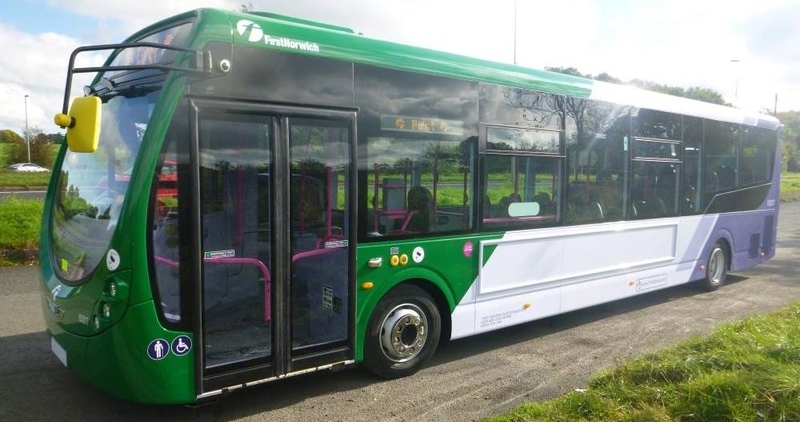 Colin intends that it will be remain in Barbie livery and wants to use the advert frames to boast about the bus' status. There is also a lot of advertisements inside which he wants to keep as a historical feature so it makes more sense to stick with the 'as withdrawn' theme. 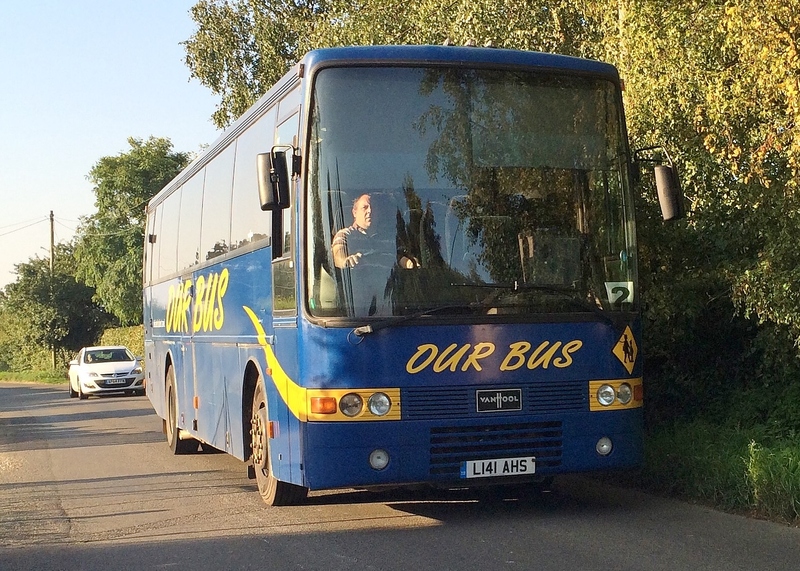 At a rescheduled Public Inquiry on 19th October 2015, Sanders Coaches were issued with a formal warning. However, directors Paul Francis Sanders and Charles Edward Sanders were found to be of good repute. The repute of both of them as Transport Managers was also found to be good. Christopher Henry trading as Fox Cars of Benacre, Beccles has changed its operating centre from High Street, Wrentham to The Street in Benacre, Beccles with authorisation set at two vehicles. 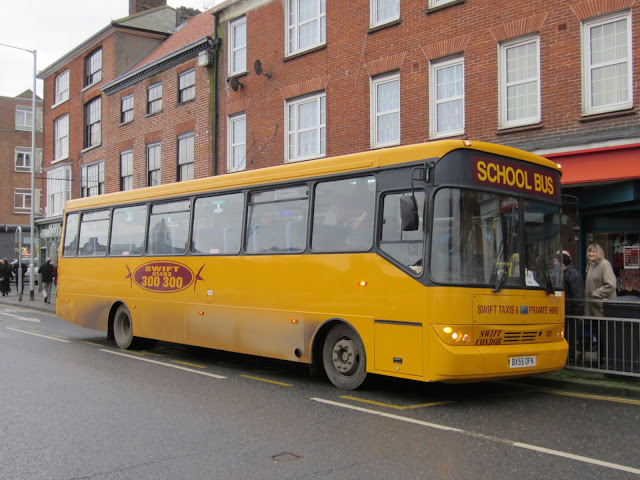 As we reported last week, former Greenline Gemini 32348 LK53LZL returned to Yarmouth after repaint at Full Circle, Banham. It entered service on Friday and was soon the talk of social media as it was noted carrying incorrect fleet numbers 32438. 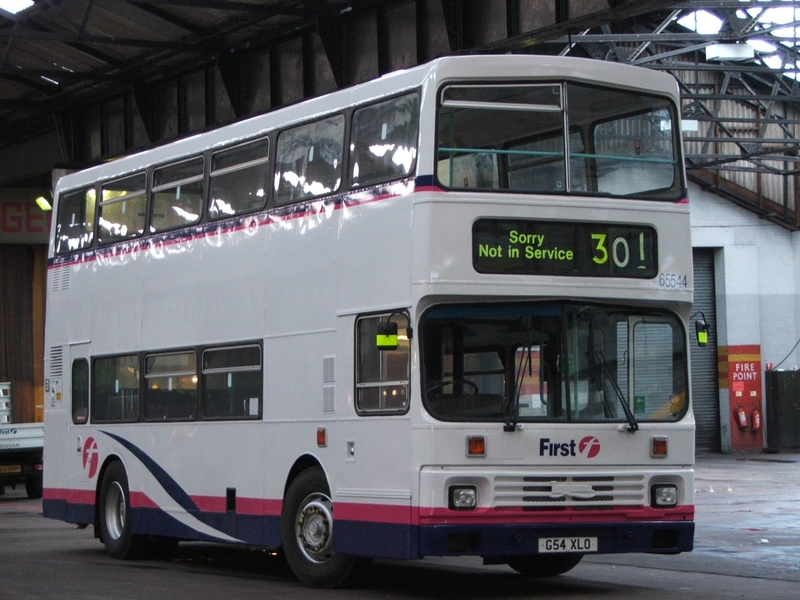 The actual 32438 is another Gemini belonging to First Leeds YJ04FYH. This scenario has occured before at Caister Road, back in 2005, Repaints of Blue Bus liveried Olympians were taking place with vehicles being sent to Rotherham to be painted in corporate Barbie livery, G54XLO (34954) returned to Yarmouth incorrectly carrying the fleet numbers of what was at the time a Scania belonging to First Ipswich! G54XLO wearing 65544 at Caister Road in February 2005. Thanks to Mal for use of his photo, im sure the real 32348 will appear soon! 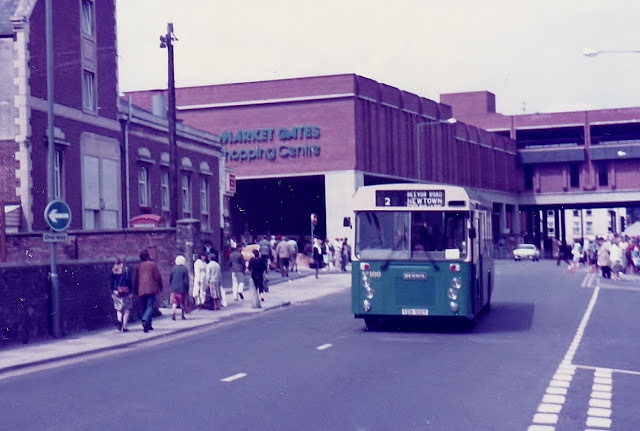 Bob Jenkins says he drove just about all those loaned to Ipswich and provided a photo of a couple of them taken by an enthusiast who he was friendly with during the 1980s when he was a driver. However, unfortunately he couldn't remember his name but I found the same photos on Flickr and contacted the photographer concerned. His photo above shows Ipswich 110 C110SDX at the front of the Great Yarmouth depot some time during 1994 and what is also unusual was an unidentified Great Yarmouth Swift is lurking in the background! 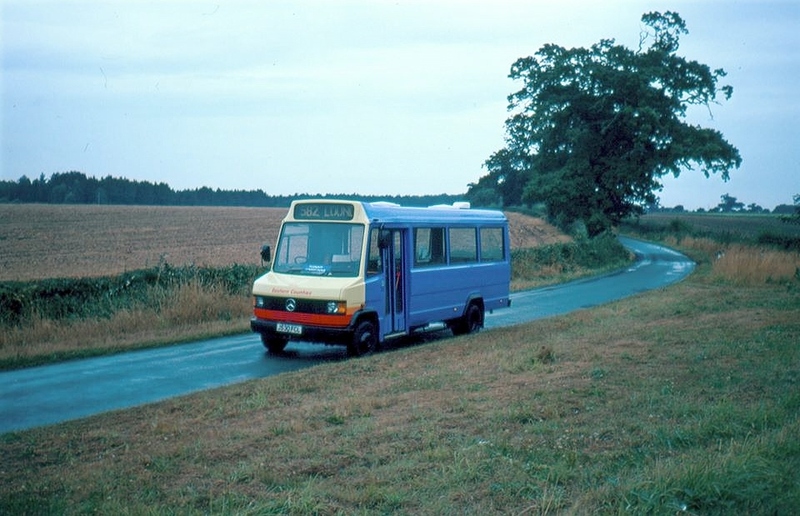 Syd says that 'Eastern Counties played with a couple of Falcons at Great Yarmouth too....here is one just behind James Paget Hospital on a Great Yarmouth to Somerleyton 582 run, normally in the hands of the Mercedes Benz minibuses'. 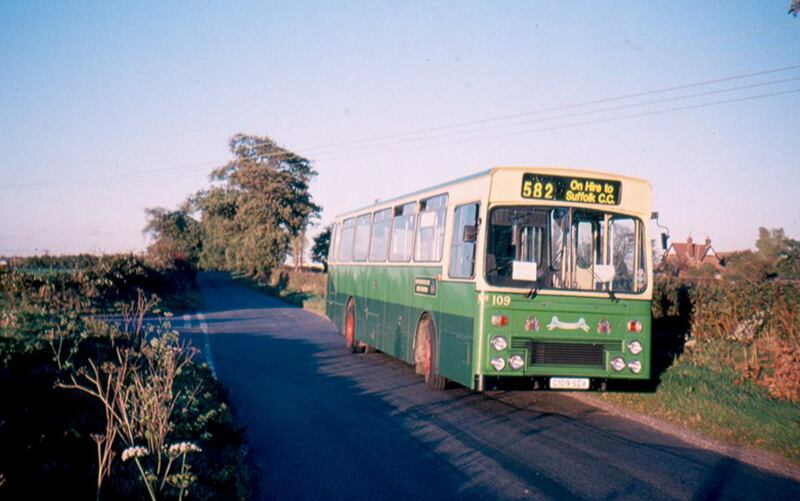 Syd also supplies a photo of Eastern Counties Mercedes J530FCL in use 'on the 582 on the same day as the Falcon, the Purple base was for a 'Target' advert that was yet to be applied! Note the lack of passengers in the pre-concession era, no wonder the service was withdrawn'. 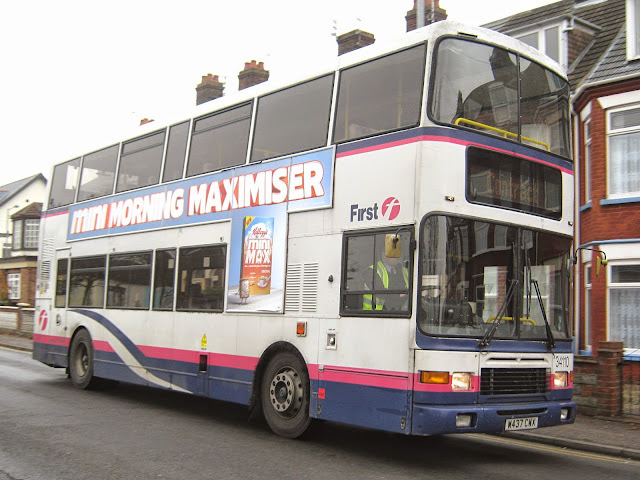 A Quick update from Caister Road this morning. 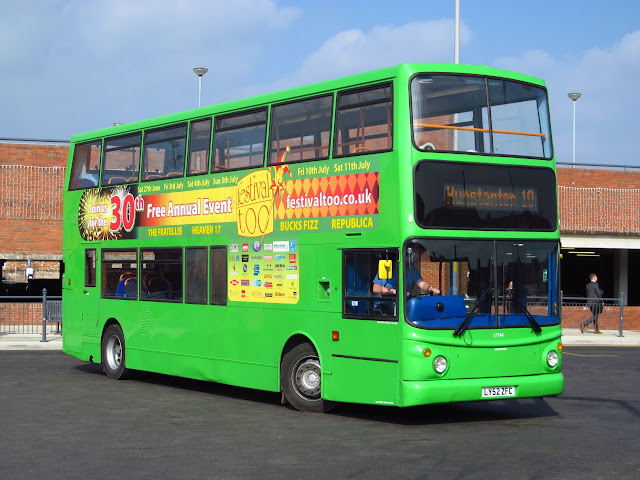 Volvo B7 32348 LK53LZL has returned from repaint at Full Circle and is now in full urban livery (ex Greenline). Routemaster 39480 JJD480D was out and about for a fourth day yesterday working the 7 service. 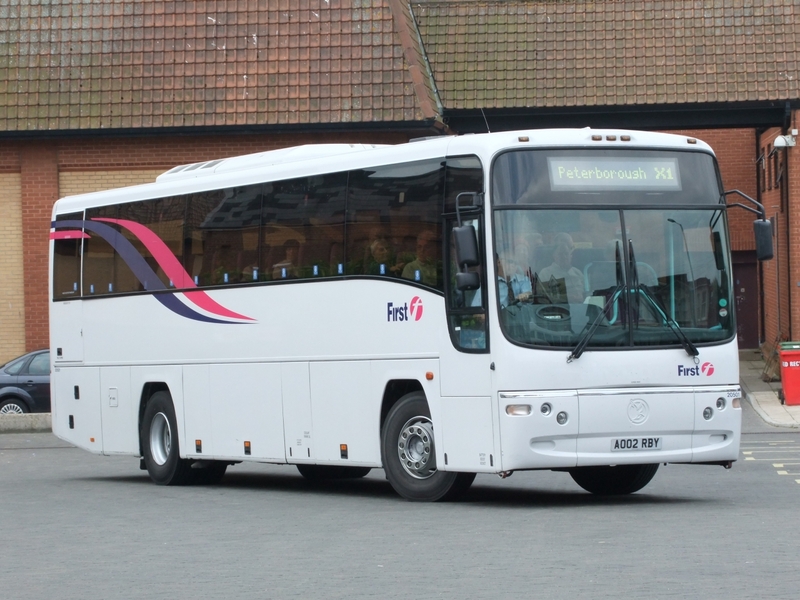 Coach 20515 WV02EUR has now moved on to Norwich for use on Bernard Matthews contract work joining 20501 AO02RBY which made the trip earlier this week. Thanks to Steve for the photo. Grahame. 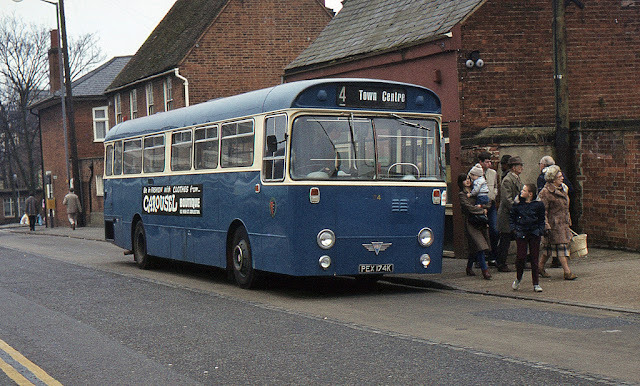 In addition to its use on the 6 to Bradwell and the 7 to Belton, it was also employed on service 8 between the James Paget Hospital and Caister. After a message from my sister in law that it was on the 8s this afternoon, I mentioned it to regular contributor Jamie Skinner who was hopeful of gaining a ride on it. 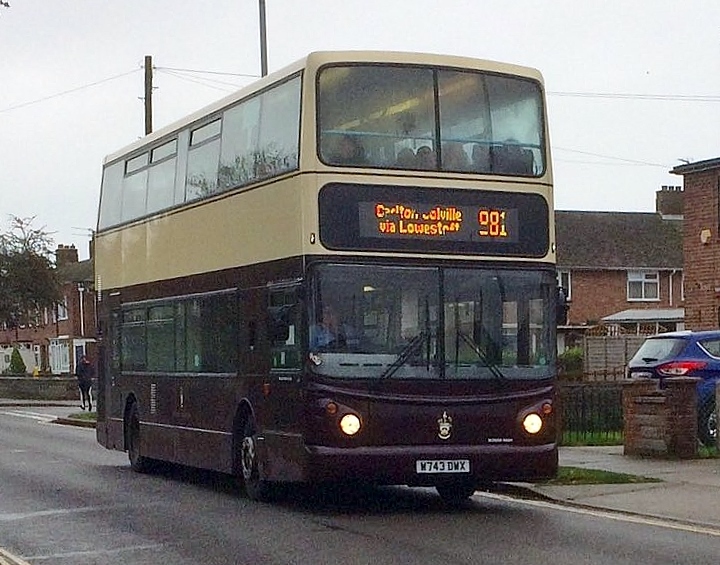 Whilst awaiting its arrival, Lowestoft heritage liveried ALX400 bodied Volvo B7TL sailed past with the 881 from the East Norfolk Sixth Form College and he, naturally, got a photo of it! Not one to turn down an offer, he boarded for a short journey to Southtown Road with his mission accomplished! My thanks to Jamie for the report and photos. Let's hope it continues in service for a few days more so I can get a ride on her too! 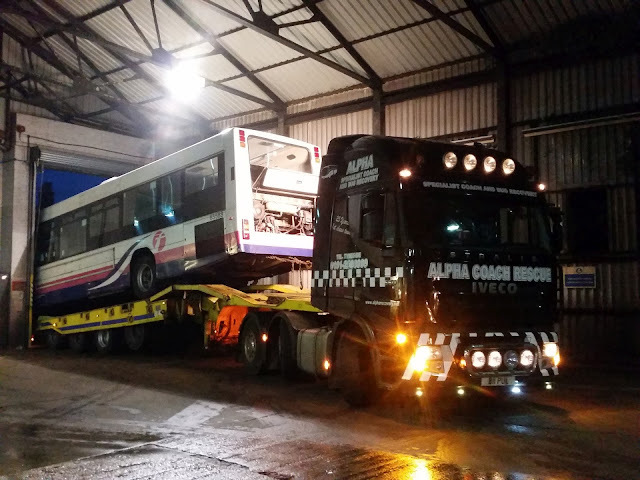 Yesterday saw Caister Road say goodbye to two of its long term withdrawn residents as they were collected by Alpha Recovery and headed up to the North East for scrapping. Olympian 34186 S686AAE & Scania 65588 V588DVF were removed from the back yard and loaded up. 34186 arrived at Caister Road from First Bristol in December 2008 along with sister 34187, both were used on a variety of routes but latterly 34186 was restricted to Contract work before failing with Gearbox problems earlier this year. 65588 had a very brief career at Yarmouth after arriving from Norwich in late February this year. 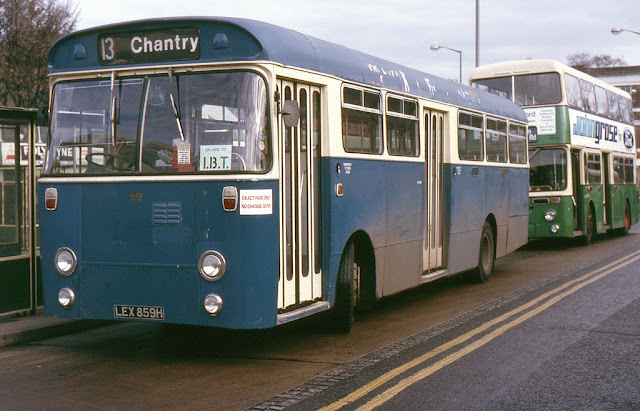 Originally new to Ipswich where it had spent most of its working life she transferred to Norwich before surprisingly appearing at Caister Road and only worked a matter of days before failing and then spent the next 7 months tucked away in the corner out of use. 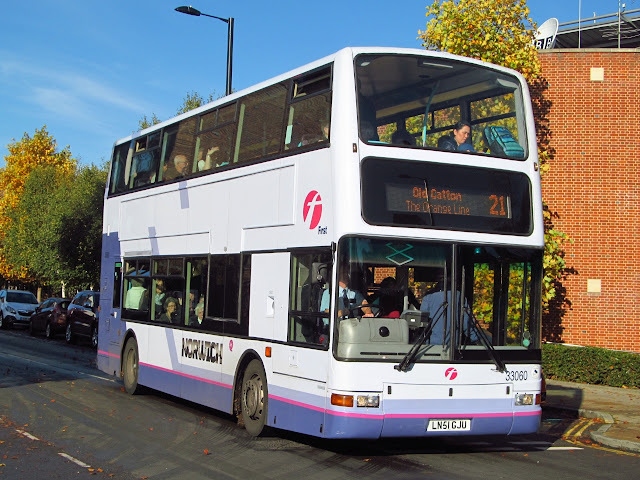 Other news to report includes another day of public service for RM 39480 yesterday on the 6/7 services in the town, Coach 20501 has now had its MOT and moved up to Norwich to assist with Bernard Matthews contract duties. Thanks as always to staff at Caister Road. Grahame. We can reveal some of the First photographs of the new Green fronted livery for the new Wright bodied Streetlites for First Norwich. The photographs were taken earlier this week at the Wrightbus factory on Ballymena, Northern Ireland. 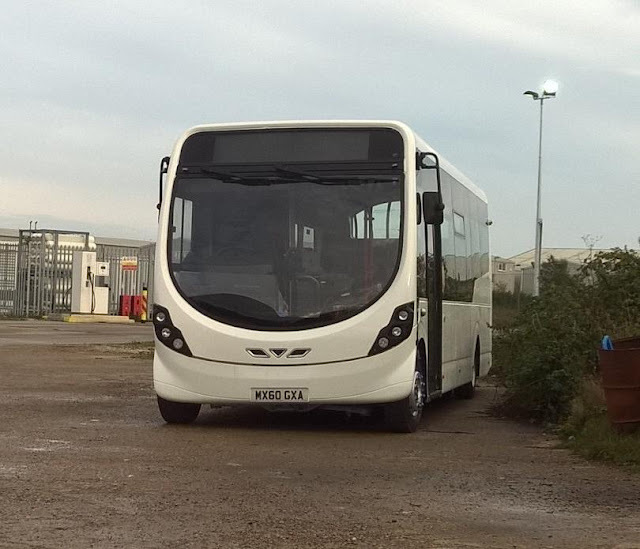 The batch of Streetlites is to be numbered 63317-63327 with the first of the batch 63317 registered SK65PWX. 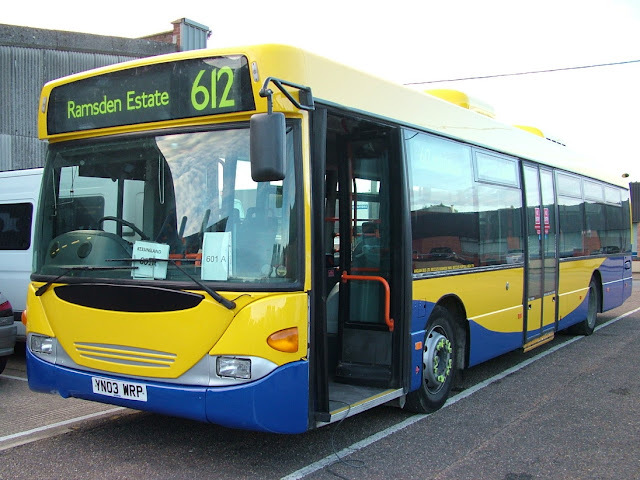 They are the Streetlite Max version, larger than current batch at work in the city and at Yarmouth hence being numbered in the 6 series rather than the 4 as the previous ones are. They are 45 seaters. Delivery of the batch should begin next week, with the first vehicles being ferried over from Ireland. Many Thanks to Chris Speed for allowing the use of the photos and info. It is the time of year where Mill Farm in my home village of Ormesby St Maragret increases its workforce meaning the arrival of a couple of visitors being regularly noted in the yard. I noted two vehicles whilst passing, firstly former Dublin Olympian GOX78V which was new as 99-D-605 and former Stagecoach Strathtay Volvo 16073, R173VPU, new to Stagecoach East London as VA73. R173VPU pictured this afternoon on my phone! Both vehicles are operated by G's Holdings of Soham who run a fleet of vehicles for this type of contract work. 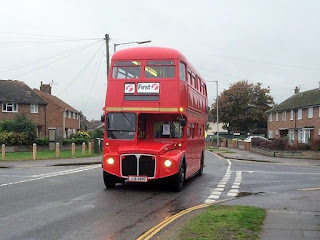 Former Chambers of Bures Olympian P484MBY was noted here last year also. Today I had the 'immense pleasure' of shopping at Gapton Hall Retail Park and also enduring the queue to get out of the place! 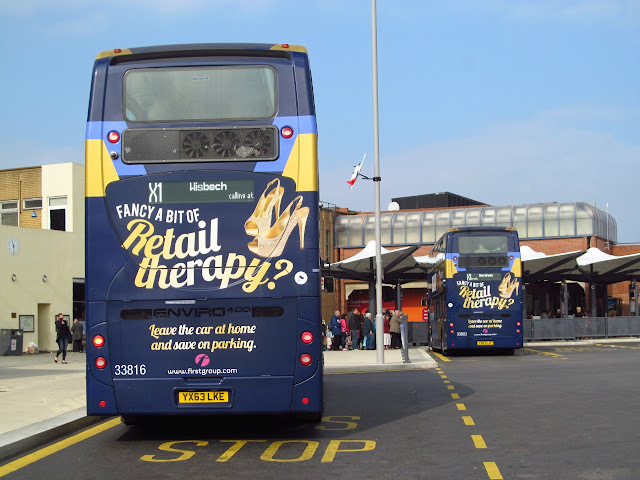 However, one of my reasons for 'reluctantly accepting' was that I would be able to observe which of the Our Bus vehicles were being used on the Saturday and Wednesday only bus service to the retail park. 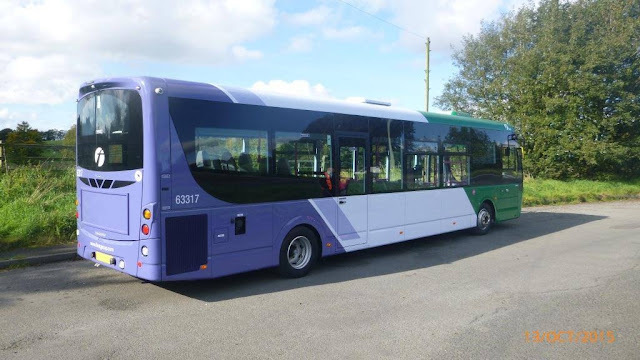 Further to Sunday's post and the arrival of the two Greenline liveried Geminis, we can bring the latest update regarding the use of both vehicles. 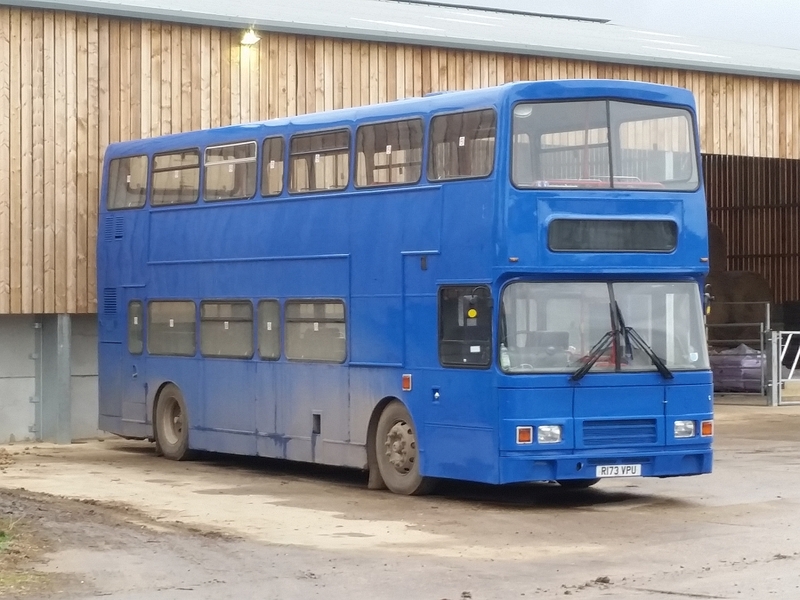 They were taken to Full Circle at Banham yesterday for repaint, 32348 (LK53LZL) will gain the standard urban livery whilst 37274 (LK58EDF) will wear the Blue Excel livery. 20501 on X1 duties at Lowestoft in May 2010. Coach 20501 AO02RBY which arrived back last week from Chelmsford will undergo MOT before being used on Bernard Matthews contract work which should see it move up to Norwich for use there. 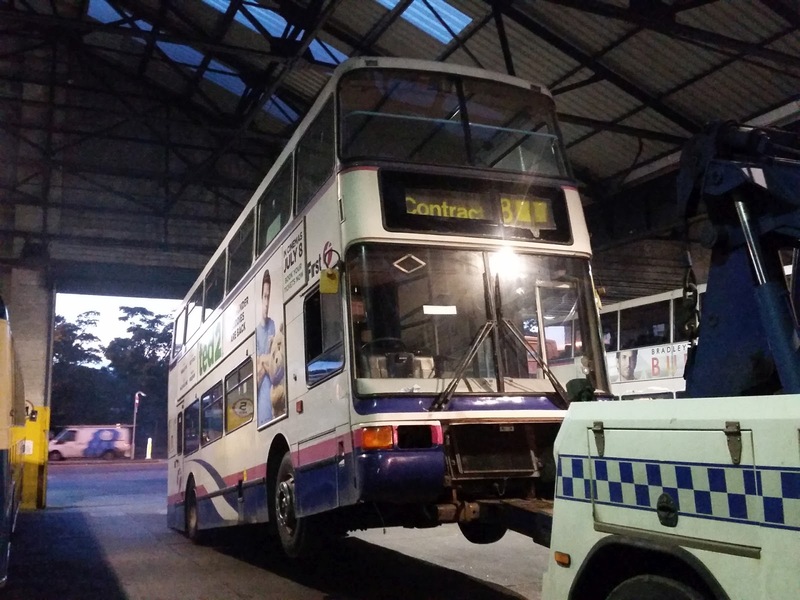 Finally Dart 42920 EU05AUM has also gone to Full Circle for body repairs and will also be repainted into the new livery. Many Thanks to Danny Beales for the info. Grahame. 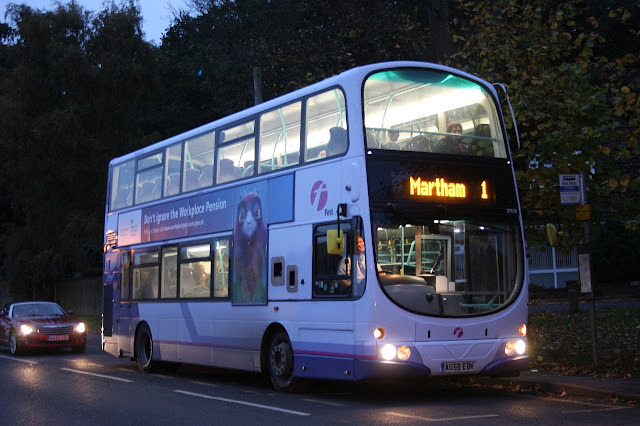 Anglianbus are to introduce several service changes coming into effect from Monday 2nd November 2015. 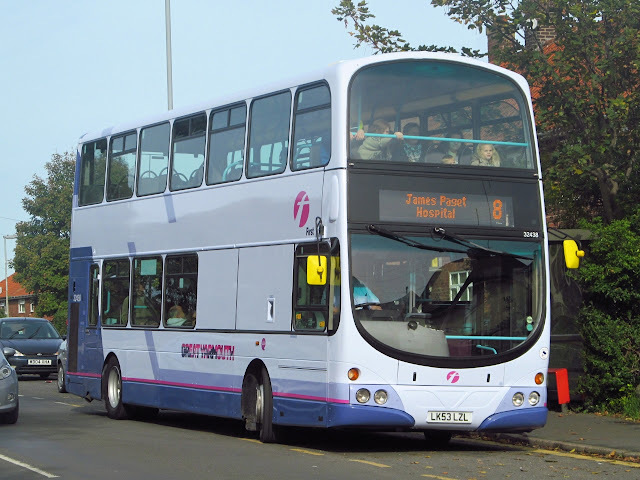 Several of the routes have been operating at a financial loss and it is no longer viable for the company to continue to do so. 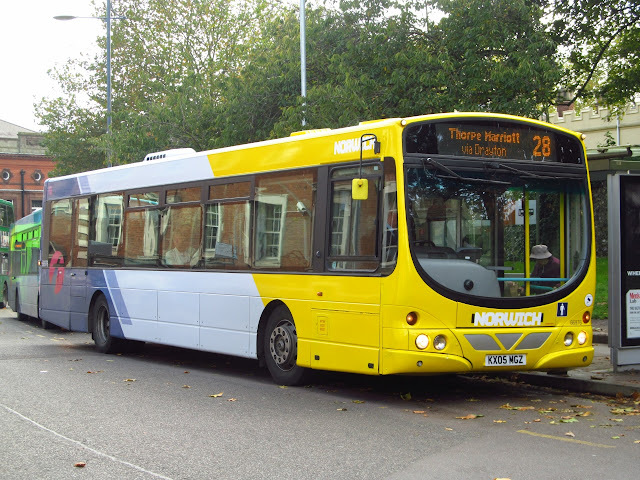 The changes affect timetables and routes of many services including 7/61, 60, 60H, 60S, 80/81, 82/82A, 87, 88/X88 and 88A. 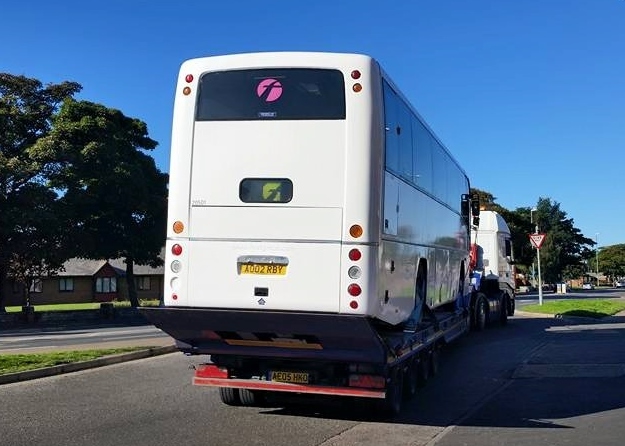 Latest arrivals for Eastern Counties fleet arrived at Caister Road this afternoon after being collected from First's Slough Depot. 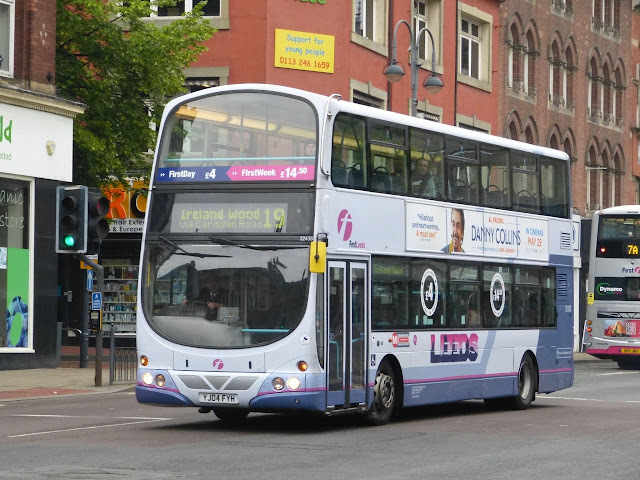 The two arrivals are 32348 LK53LZL Volvo B7TL Wright Gemini and 37274 LK58EDF Volvo B9TL Wright Gemini. Both are in Greenline livery where they were used at some time on the 702 service between London & Windsor, 32348 had been working local services prior to its withdrawl. 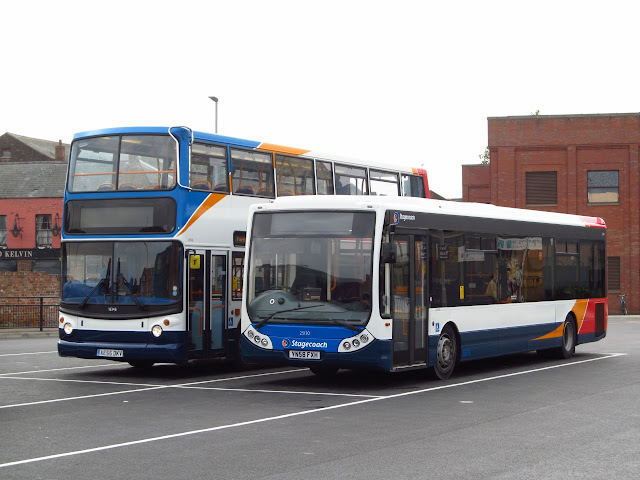 Both will initially be used on Bernard Matthews contract work before moving to other services within the company. Thanks to Management at First for permission to publish. Grahame. 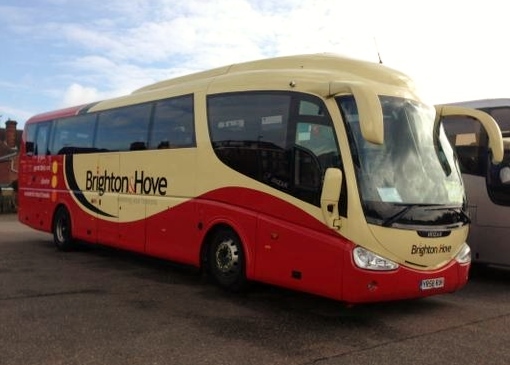 An early afternoon visit to Beach Coach Station revealed a visitor from Brighton amongst the trio present. It was Brighton & Hove Irizar Century bodied Scania 503 YR58RUH and was making its third visit to the town this year - that I am aware of. The latest is its BMC Falcon 1100 FE schoolbus BX55OFN, new to the company in February 2006. It subsequently received fleet number 110 and named Swift Condor. 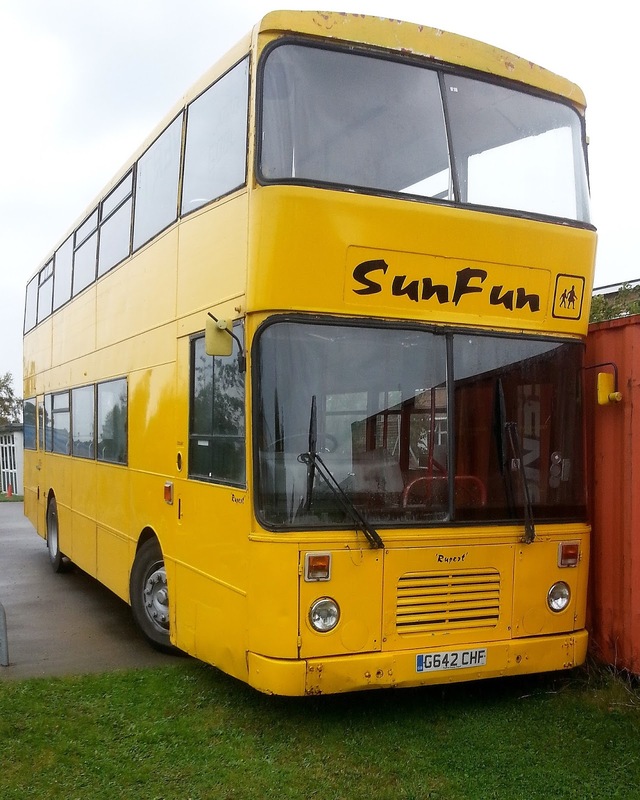 It has just had its engine rebuilt although its MOT expired at the end of last month. A few moves to note from yesterday. 33157 LR02LXS has gone up to Rotherham for refurbishment with 33166 LR02LYD returning to Norwich. 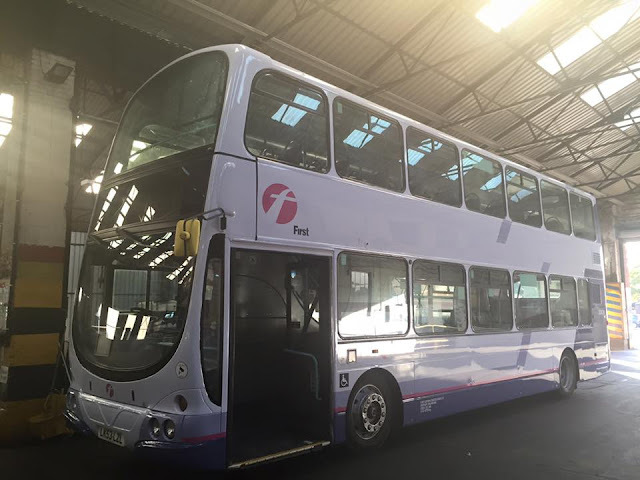 Volvo B7L's 66301 KV02VVC & 66326 MV02VBA have both moved down to Bristol. Thanks to First for info. Grahame. A seond trip up to Kings Lynn for me this year to catch up with the latest happenings in West Norfolk. 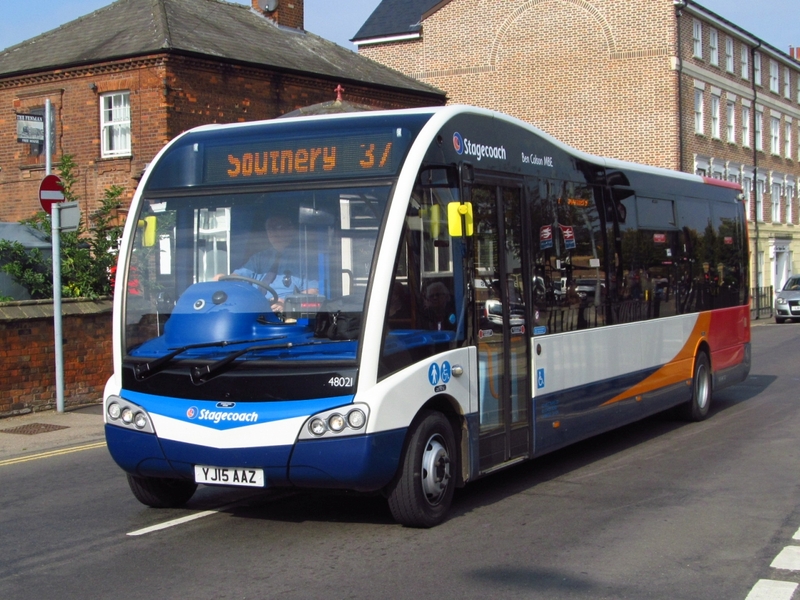 The Norfolk Green name has been replaced with Stagecoach Norfolk now, meaning the corporate image of Stagecoach is slowly beginning to show itself in the town. A number of corporate liveried vehicles are on loan here to cover repainting of native vehicles into the new beachball livery plus a batch of brand new Optare Solo SR's have been purchased. The new corporate look of Kings Lynn Bus Station. Two ALX400's have recently arrived from Stagecoach East, 18348 AE55DKV & 18349 AE55DKX have appeared to bolster the fleet as the batch of Optare Spectra vehicles here appear to be being phased out, none were in use yesterday and all were parked up at the Depot when i visited. 48021 YJ15AAZ Optare Solo SR "Ben Colson MBE"
Kings Lynn has always been one of my favourite places for photography but the new bus station layout has put paid to many opportunities due to the new bus stop layout and a new exit at one end meaning on days like yesterday the sun cuts out may areas to photograph, a nice cloudy day is on order for the next trip! 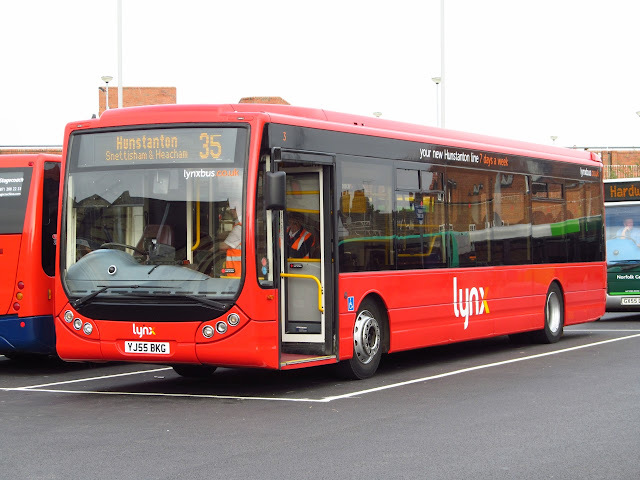 Lynxbus and Konectbus also run services in Kings Lynn and i noticed Lynx 35 service was departing to Hunstanton with good loads on most trips out of the Bus Station. First also continue to operate the X1 service between Norwich and Peterborough. 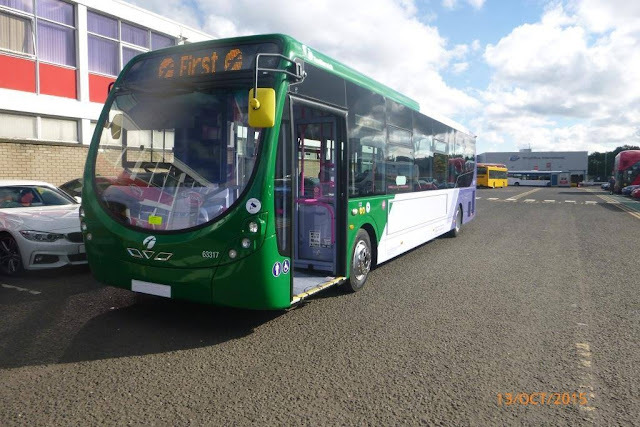 First Enviros in the new bays at Kings Lynn Bus Station. 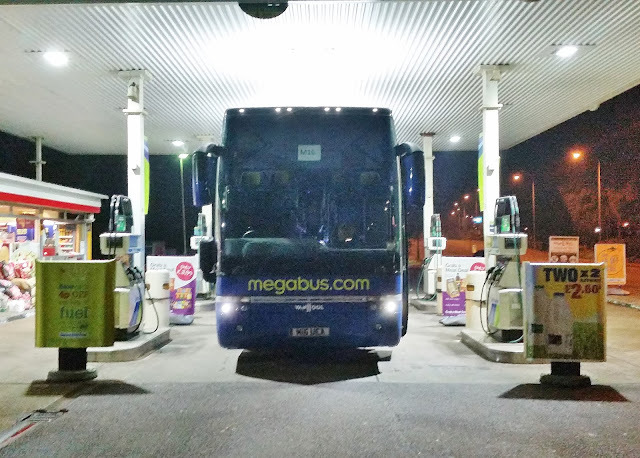 An enjoyable few hours in the town catching up with latest arrivals and a look at the new bus station, i did manage most of the photos i was after, even managed a few at Dereham on the way home!